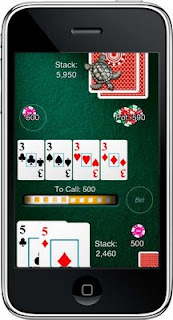 Peter Burford's Blog: Heads Up: Hold'em version 2 IS AVAILABLE!! Version 2 of Heads Up: Hold'em is in the AppStore now! I really hope everyone enjoys it. More (and better) AI personalities. Hopefully bluetooth (and WiFi) support when OS-3 is out to allow play on 2 iPhones. For what it's worth, I won £175 playing £1-£1 at the Grosvenor Victoria (Old Vic) Casino. I also sold a copy of iCatchall to one of my friends there. Does that make it a business trip? PS: The picture is from the plane home. A nice "REALLY??? I flop a full-house and then THIS happens" moment. Version 2.0 of this app is great! I love it, just want to report a bug to you and submit my suggestion. I customised the top card guard as a red chip and the bottom as a black chip, but everytime I load the 2-player with chips mode, the card guards appear to be two black chips, and I have to triple tap to go out to the menu and resume game to get the red chip. So I think this is a bug. I love your bluetooth idea and I suggest about to add WiFi connection as well. Anyway, my suggestion is, as sometimes we want to pause a game with the AI and play a game with our friends using this app, we cannot do that now because we have to end the current AI game in order to use the 2-player mode or cards only mode, so I suggest that you add a function to save the AI game, but we can still use the app to play a game with our friends and then come back to the AI later at night in the bed before going to sleep! Just a suggestion though. You're right about the chip color bug. I think the top chip always shows as black (the default) when starting a new game. Will be fixed in the next version. It also sounds perfectly reasonable to suspend a 1-player game to play 2-player and then return to it later. We'll add that to the 'to-do' list. Thanks for replying the comments. I an wait for the next update!